Okay, so technically it's not a watch... but I think this clock is pretty cool and thought I'd share it with you. 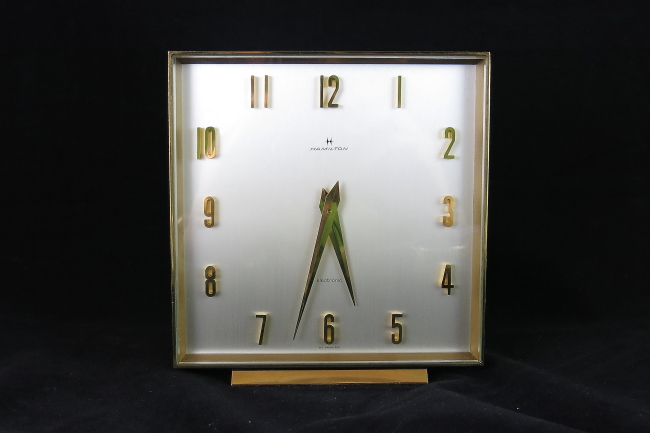 My guess is this is a 1970's clock but it could possibly be a 1960's model based on the font of Hamilton logo. It's about 7" square. I happened to be in a local clock shop the other day buying some supplies and decided to look around at their very impressive inventory of clocks. I don't have any experience tinkering with clocks but I do find them very interesting. I would have a ticking clock in every room of the house if my wife would let me. My experience has been that "clock guys" don't tend to work on watches and "watch guys" don't tend to work on clocks. I think the reason for speciality is the mechanisms can be unfamiliar and also involve a different setup for tools. Anyway - while perusing the myriad clocks on the shelves I came upon this Hamilton mantle clock. I immediately thought to myself, "that looks like a 1958 Drummond". See for yourself. I've had a couple of Drummonds in the past. Here's a photo of one but you can probably tell that it has a poor redial... note the second track is incorrect and the Hamilton logo looks a little off center. When I got the clock home I put a fresh battery into it and found it would run for a while and then stop. In looking it over, I realized that it does not have a quartz movement. It actually ticks and has a balance wheel inside of it - the movement is sort of like a giant Hamilton 505 electric movement, electrical and mechanical. I put the clock up to my watch timer and found out that it has a beat rate of 28,800 beats per hour or 8 ticks per second. 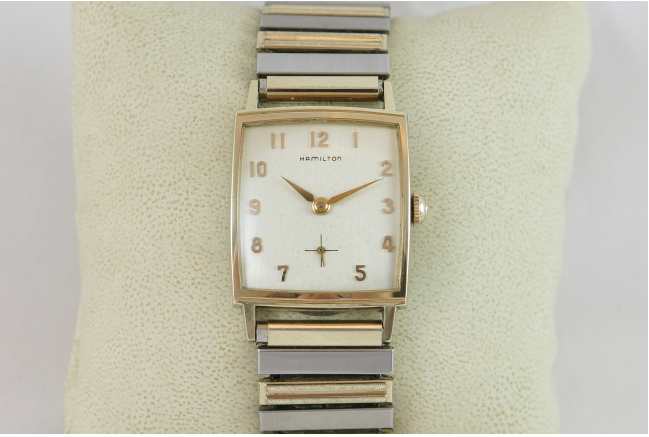 Most vintage watches have a beat rate of 18,000 BPH or 5 ticks per second. 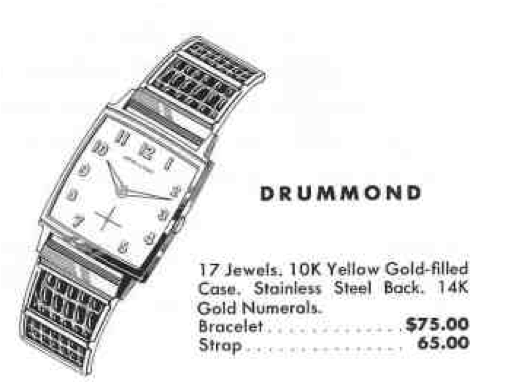 28,800 isn't unusual for a modern watch though. Well, having a clock that's only right two times a day is pretty frustrating so I decided to try to fix it. I didn't have anything to lose - as it wasn't going to work without some help. I took it apart enough to re-oil all the pivots (where the wheel axles are held). I reassembled it, put the battery back in and it's running like a champ now. Now to find a place where my wife won't mind seeing it.